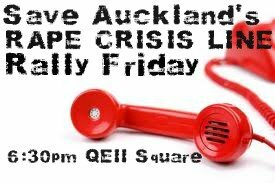 Luddite Journo has written several excellent posts on the urgent funding plight of Auckland's 24/7 phoneline for those affected by sexual violence, run by Auckland Sexual Abuse Help. You can still sign the petition, currently over 5000 sigs in less than a week. WHERE: Outside Nikki Kaye's electorate office, 82 College Hill, Freemans Bay. WHO: Anyone really who wants to show support for the service, and the organisation in general. I'll be there, with Snuffly and cupcakes. I'll add a link to the media release on this once it is up. WHO: All welcome, bring your ranty voices! Facebook event with more info is here. If you can only make one and are trying to pick then I recommend the evening event, as that's where numbers will be most important. Although, if the funding from Government is pledged before 6.30pm then it may be cancelled (in which case I'll try my best to put an update on the blog).